It’s not everyday Olympic athletes visit your office. 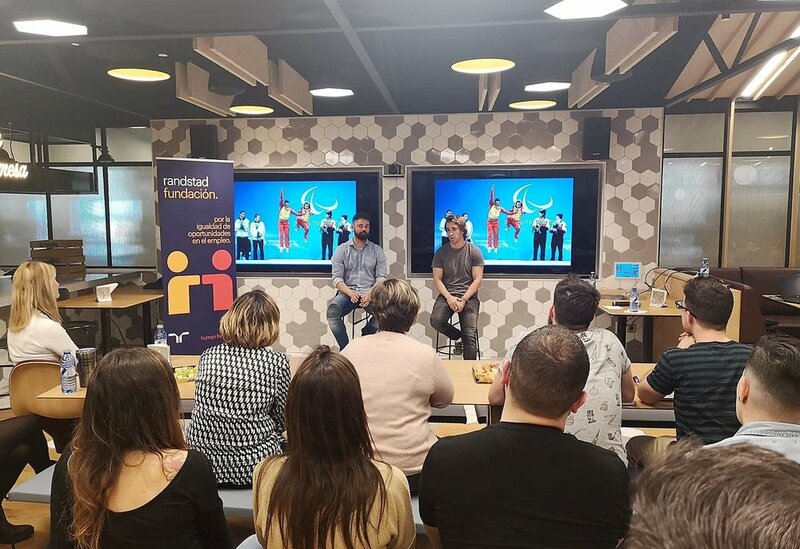 The highly decorated Jon Santacana and Miguel Galindo, the Spanish Paralympic skier and his guide, stopped by to speak with our team in Madrid and share their story about how they’ve become the fastest pair in the world. At eight-years-old, Jon was diagnosed with Stargardt disease, an inherited juvenile macular degeneration that causes vision loss. Jon began skiing competitively when he was 17-years-old and in 2000, he joined the Spain national team along with his guide, Miguel, who is always by his side. “I don’t know if I am able to achieve everything, but for sure I am able to try it!” - Jon Santacana. Jon and Miguel shared an inspiring story about how to overcome issues that can work in all areas of life. In the early stages of their careers, they noticed that they were doing well in competitions that required technique, but not in the competitions that required speed. Their first step was to identify what was hindering their speed. They soon discovered communication was the issue and they started to investigate how they could solve the problem. Through an iterative test and learn process, they found a solution that improved their communication significantly. They grew faster over time and eventually won gold in the Salt Lake City 2002 Winter Paralympics. 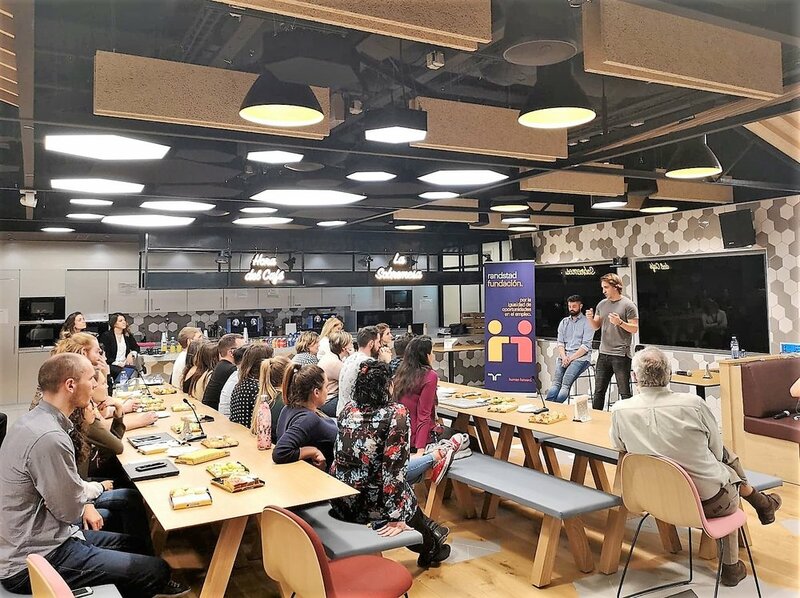 Team HomeAway loved this story specifically because it was a great example of how they embraced Scientific Mindset, one of our core values. Jon said he feels lucky despite the limitations he faces every day. Jon emphasizes trust as a fundamental value, in himself and in his guide Miguel, who he refers to as his “other self.” Of course there is an amount of fear that comes with moving at 120 kilometers per hour with only 5% visual acuity, but Jon assures that these adversities can only be broken down based on trust. This value is, in his opinion, the most decisive when reaching for your goals. "In the top level sport and in the business world, self-confidence is the key to success." It’s Mardi Gras season and who knows how to celebrate Fat Tuesday better than Louisianans? These employees may live in Austin now, but they never stray far from their Cajun roots. Meredith, Shaler and Katie are sharing how they celebrate the holiday with their favorite traditions and foods. If you’re not familiar with the history of Mardi Gras, you can learn more here. 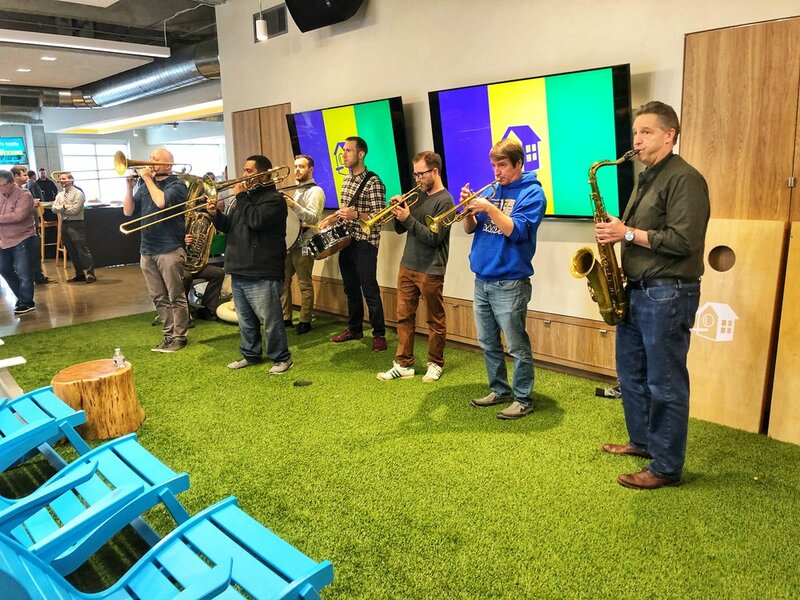 The Urban Achievers Brass Band celebrating Mardi Gras with Team HomeAway in our Austin office. What is your favorite Mardi Gras memory? Now that you live in Austin, how do you celebrate Fat Tuesday? I’ve lived in Austin for over 10 years now, and I try to at least eat some King Cake, wear beads and rock purple, green and gold on Mardi Gras day. This year, I’m excited that I’m getting to celebrate with Team HomeAway at the Culture Week closing party at our office! - Meredith C.
I’ve been away from Louisiana a long time, but we still do beads with the kids, and make it back when we can. - Shaler W.
After 14 years in Austin, I still order a King Cake each year from my favorite bakery, Haydel’s Bakery, and have it delivered to work. This year I’ll be in Louisiana for Mardi Gras! - Katie T.
Meredith enjoying the Mardi Gras festivities at our office party in Austin. What are your favorite traditions and foods? KING CAKE! JAMBALAYA! GUMBO! - Meredith C.
King Cake, Gumbo, Shrimp PoBoys - Shaler W.
Listening to Mardi Gras music and eating lots and lots of king cake (and seeing who gets the baby, of course)!!!! Mardi Gras Mambo, anyone? - Katie T.
Matt Carboni representing his alma mater, Louisiana State University. What do you miss most about Louisiana? Getting days off for Mardi Gras! And reasonably priced boiled crawfish… - Meredith C.
The food, the architecture, the slower pace of life. The fact that every neighborhood has its own unique culture. - Shaler W.
Absolutely the food and getting days off for Mardi Gras, but also in my area of Louisiana, I would have to say the people. Everyone there seems to genuinely care about each other and the community. Cajuns are a tight-knit group. You can’t go to a grocery store without striking up a conversation with someone in the checkout line. They always wish you and your family the best and do it all while calling you “cher” (pronounced “sha”) - Katie T.
The Career Exploration Program (CEP) is one of the newest concepts created by our Learning & Development team aimed at helping employees navigate and accelerate their career at HomeAway. This program is ideal for employees who are interested in exploring another career path, but lack the skills to join a programming team. Hear from the first CEP group and find out what it takes to succeed in this engineering crash course. What made you want to apply for the Career Exploration Program? 3. What was your biggest takeaway during the boot camp? Miguel B transitioned from a Customer Experience role to a full-time position as an Associate Software Engineer. 4. Any advice for other people trying to make a career transition into tech? 5. What qualities does someone need to have to be successful in the CEP? Everyone thinks their friends are amazing, smart, and fun, but would you actually want to work with them every day? Zach Bird, eCommerce Optimization & Sales Coach does! He referred his friend Josh Ziman, now Sr. UX Designer and they are the self-proclaimed referral kings of HomeAway. They are sharing why they love their jobs and how they are helping their friends work here too. 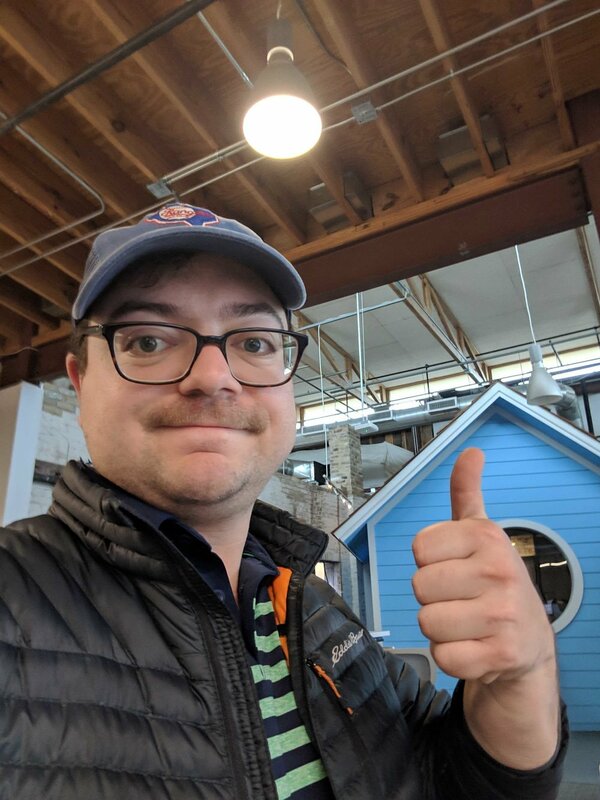 Zach taking a selfie in front of the birdhouse meeting rooms at our Penn Field office in Austin. Zach and Josh met at The University of Texas, Austin and have stayed friends in their postgrad years. When it came time for Josh to leave startup life, he asked Zach about his HomeAway experience. This was enough to pique Josh’s interest and begin the application process. 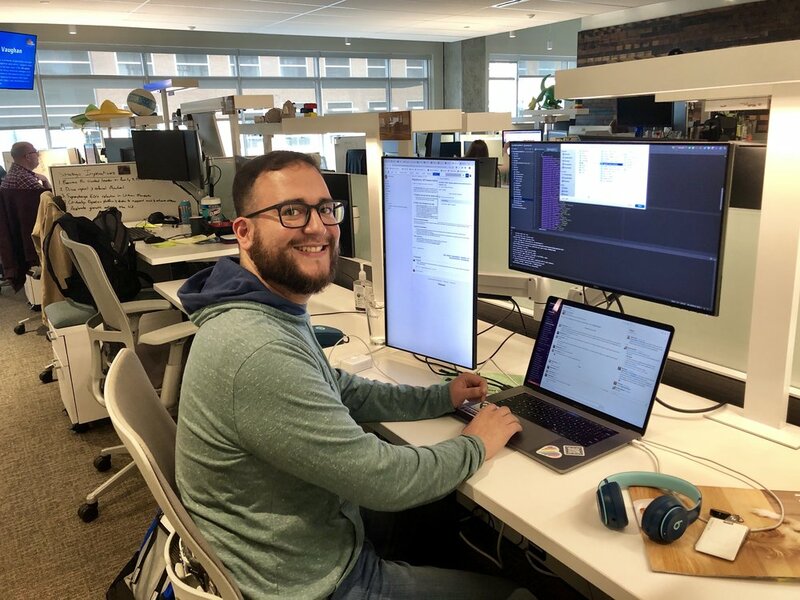 Now that Josh is officially part of Team HomeAway, it’s much easier for him to give insight about the day-to-day on the engineering and product teams. 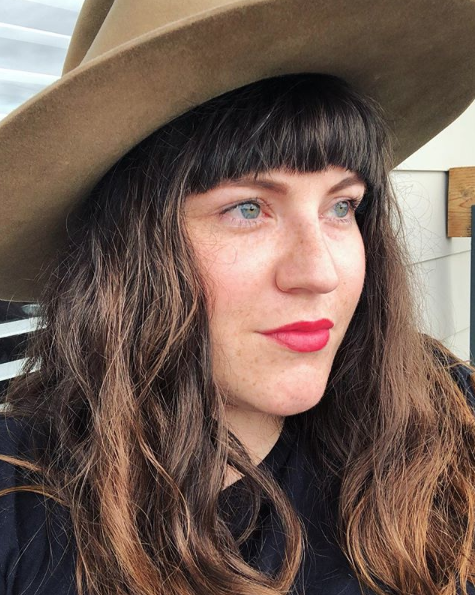 “Before HomeAway, I was the sole UX designer at a eight person startup in travel and hospitality. We built products for hostels and backpacker transportation in Latin America. On a small team, my work spanned many disciplines, which is what I preferred at the time. HomeAway allows me to focus and ‘go deep,’ which is what I wanted next. We have a large team of expert designers, prototypers, researchers, and writers — a diverse group of people who grow and teach one another everyday. It’s a fantastic place to think scientifically, challenge ideas, learn new processes and improve my craft.” - Josh Z. So how are these two friends handling future referrals? Josh and Zach made an arrangement to split bonuses because they have so many mutual friends who also want to work at HomeAway! 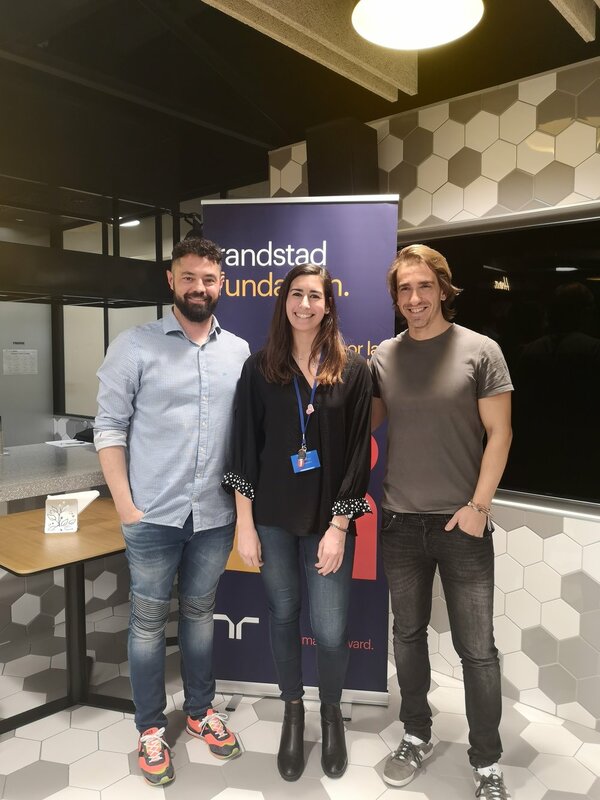 While combing your LinkedIn connections and following up with hiring managers may sound tedious, these two swear it pays off. 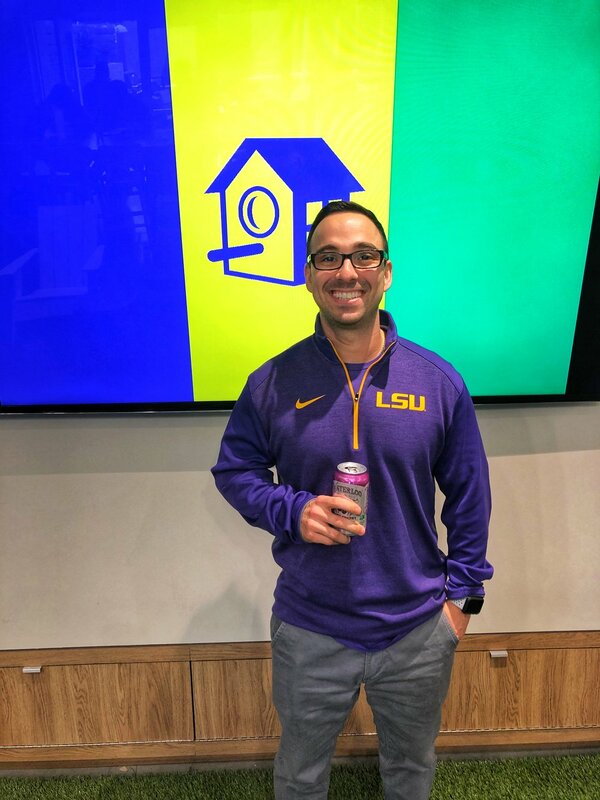 Josh joined Team HomeAway as a Sr. Experience Designer in 2018. They even have a system in place to decide who should talk to each referral. You might not be a personal acquaintance of Josh or Zach, but they have some recommendations on how to get someone in your corner to advocate for you. Whether you’re looking for a new job or looking for referrals to join Team HomeAway, it’s always easier with friends, just ask these two! I was privileged to attend the 2018 Texas Conference for Women thanks to HomeAway. It's my dream to speak there someday, but one step at a time folks! One of the many things I love about Expedia Group and HomeAway is their commitment to knowledge and learning. Many programs are offered internally that allow for professional and personal development. It’s such a joy to be able to take advantage of these programs and the opportunity to attend conferences like this. There were 7,500 people in attendance at this year’s conference. Take a minute, drink that in. 7,500 attendees (mostly women) and it was great to see some men as well! The day started with a breakfast session with (Anne Grady) about balance being bogus. It really set the tone for my day because my normal habit in an environment like this is to take copious notes (which I never look at again) and really MISS out on the opportunity to BE there. 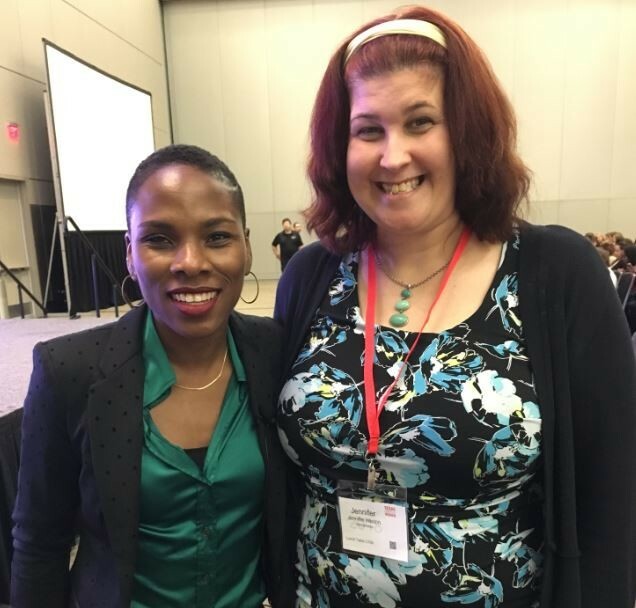 Luvvie Ajayi and I after her session. Anne asked us to think about what we would do to really BE at the conference. Turn off your phone (Phones still distracting even if off & facedown). Focus on the last letter of the last sentence that was spoken to maintain focus. I used this a lot throughout the day! I was fed, motivated and ready to start the day. There were so many takeaways from this conference, but for time’s sake I’ll share my favorite highlights. Always be early. This ensures that you’ll snag a good seat and it allows time to review the conference guide. "Choose discomfort over resentment." - Brené Brown It's not comfortable to say no, especially for women. We want to do it all, have it all and be ALL things. If you say no, you will be uncomfortable in the moment, but you won't resent the person you shouldn’t have said "yes" to in the first place. Be bold and ask questions, it often leads to great discussion! This applies to individual networking, local meetings, and conferences. If there is a conference for women in your state, I highly recommend attending. Also, encourage your company to sponsor employees to attend or sponsor a booth like HomeAway did at the 2017 conference! Working at the front desk is the perfect career launchpad to many departments within HomeAway. Why? As a front desk assistant, you’re “in the know” with office happenings, open roles, and it’s a chance to connect with everyone from the president to the security guards. Kylie Saurage, Emily Swansey, and Tiffany Lee share how their careers have changed since working at the front desk and how you can take the next step too! Q: What originally interested you in working at HomeAway? Kylie working at the font desk at our Domain office. Kylie: The first time I heard of HomeAway was when we had a stage at the Austin City Limits Music Festival in 2015. I started as a contractor picking up shifts for the front desk here and there. I thought the atmosphere, company culture, and the people were super rad. Emily: I also started working at HomeAway as a contractor covering the front desk back in 2012. That eventually led to an opportunity to work for the HomeAway Software team. When my contract with HomeAway Software ended in late 2012, I was crushed because I genuinely loved working for HomeAway. I worked for another company for nine months, applying to various roles at HomeAway, before finally finding my way back as a full-time front desk coordinator. ﻿Q: How did working at the front desk prepare you for your current role? 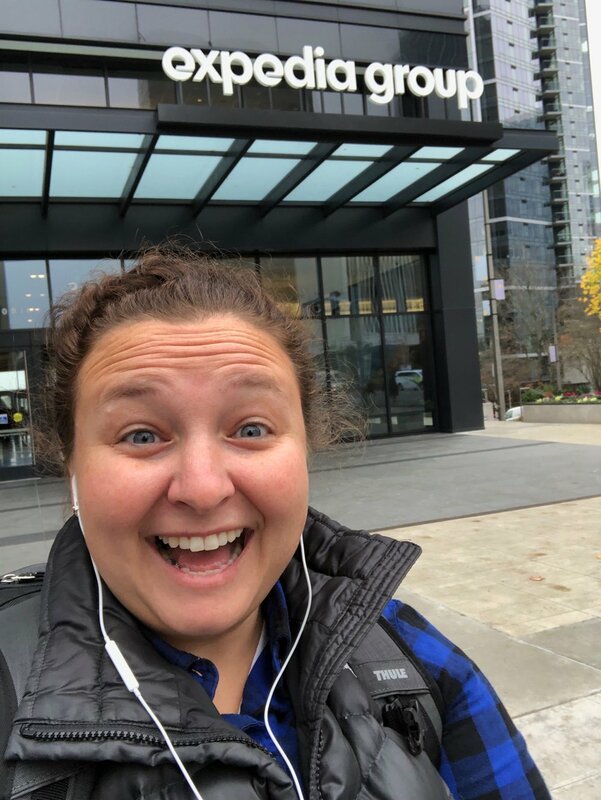 Kylie: It allowed me to interact with many different people at HomeAway so when I became a recruiting coordinator, I already had great relationships established with many of the hiring managers. There were also a lot of ad-hoc projects I worked on at the front desk that prepared me for all of the coordination I do now. Tiffany with another former front desk assistant. Tiffany: When I was a front desk coordinator, we were still a small startup. 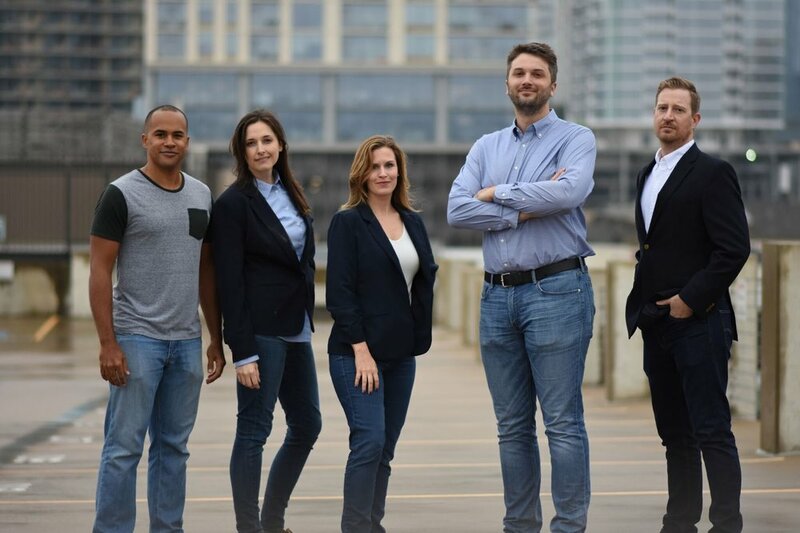 We had 65 employees in Austin and had just acquired a company with 60 employees in another city. I was responsible for many things outside the regular duties of answering the phone, office upkeep, and greeting visitors. For example, I organized our first food drive by pitting different departments against each other. The result was almost four tons of food! We had to rent U-Haul trucks to get it to the food bank. Also, when there was an executive fire, I got to help put it out. The best though? Knowing everyone in the company. That visibility is how I transitioned into a marketing role in just one year without any formal marketing experience. Now I’m the Employer Brand Manager. The rest is history. Kat and team at Spredfast Summit in Austin. 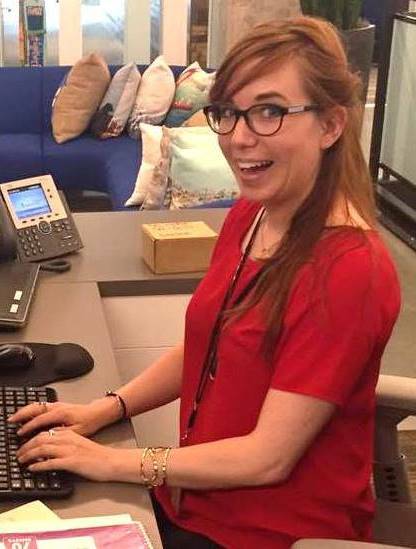 Emily: It paved the way for me to transition to the social media team at HomeAway. We have several offices in Austin and I think it’s easy for people to feel trapped and unfamiliar with other departments. Being at the front desk allowed me to network with employees and learn where my interests were, but the work didn’t stop there. I reached out to employees to get additional insight on their roles and departments. I also offered to work on side projects in my free time. In the process, I learned a lot more about the company and how genuinely nice and caring #TeamHomeAway is. What are your tips for someone who wants to get a job at HomeAway? Kylie: General tips for job hunting would be to make sure your resume is in tip-top shape. Bad grammar and spelling are red flags. Also, be courteous to everyone you interact with at HomeAway from your coordinator to the front desk person. Everyone will let the recruiter know if someone is acting up! Tiffany dressed up for her first HomeAway Halloween. Tiffany: Be diligent. Understand your skill set and how it might provide value to HomeAway. Be able to articulate that. Be yourself. If it’s not a fit right now, it could be later. Listen to the feedback and apply it to your next career move so you can come back with those skills and try again. Persist. Believe in yourself and the value you bring. Emily: If you’re already working at HomeAway and you’re interested in another team, don’t be afraid to put yourself out there. Reach out and ask an employee to meet you for coffee or maybe chat over a bowl of snacks in the bistro. There is also an amazing mentor program available now that makes it easier to connect with other teams. 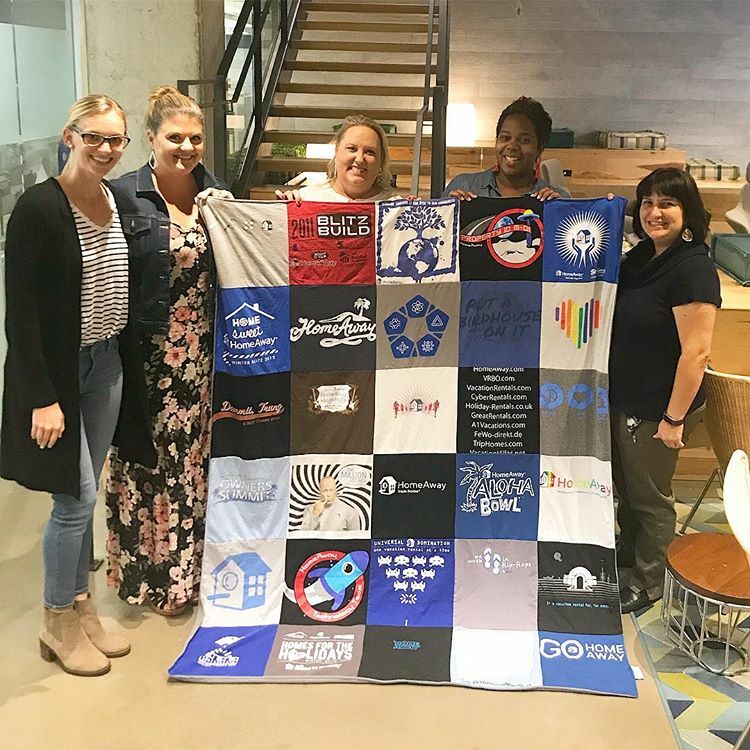 Tiffany (center) showing off her t-shirt quilt made from HomeAway shirts she’s collected during her 11 years with the company. How does the position you’re currently in resonate with your skills? Tiffany: I love connecting with employees and potential employees to share the mission, goals and values of HomeAway and Expedia Group. Talent Brand offers many channels for me to help employees tell their HomeAway stories and to make those connections with people considering HomeAway for their next career move. 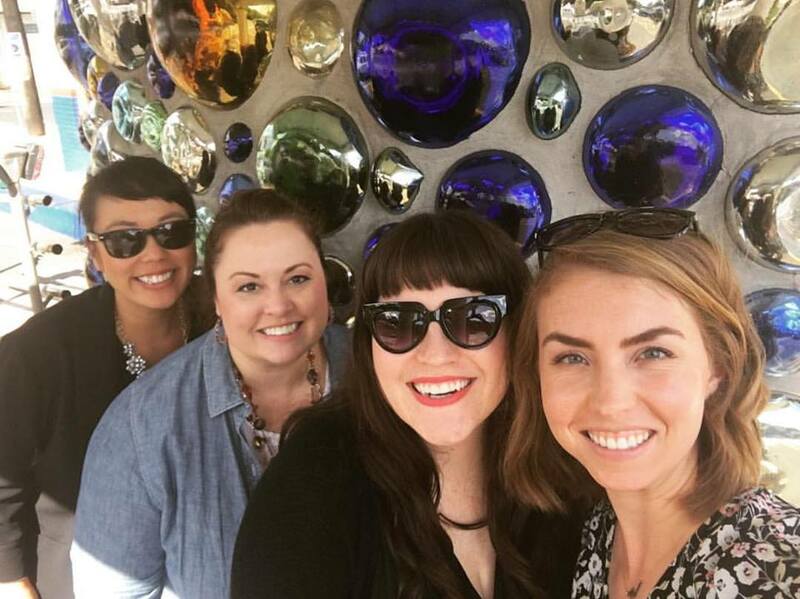 Emily’s creativity and love for social media extends beyond her role at HomeAway. View her photography on Instagram. Emily: As a millennial, I’ve always had the internet at my fingertips. I grew up in a small town where there was very little going on and the internet, specifically social media (hello MySpace and Friendster), was an awesome way for me to connect with people in other states or countries. When the opportunity opened up on the social media team, I knew I had to jump on it. I handle all of our-day to-day conversations with travelers and partners on Twitter and Facebook. It’s so interesting to see how people interact with us as a brand. 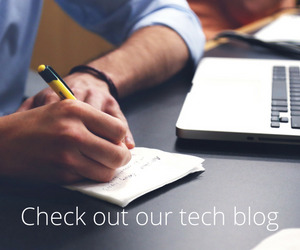 Want to join Team HomeAway or learn more about our benefits and perks? Visit our careers page!